A big thank you to all who nominated me for this award, and a big hug to all those who actually bother to read (and comment on) my rambling posts on a semi-regular basis. A little appreciation goes a long way, and I can assure you that I feel extremely appreciated! 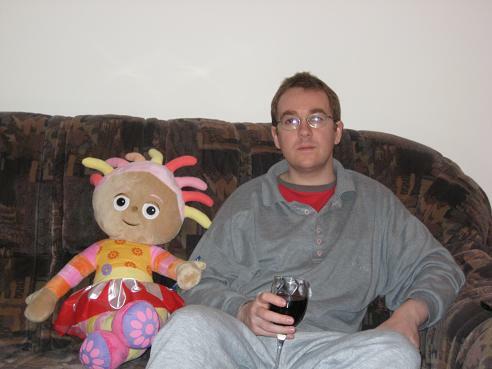 To show this appreciation, I’m posting a photo for you all; here I am, relaxing after a hard day’s blogging with a glass of red and a special friend. Again Congrats & fingers crossed you can go all the way. Congratulations. Those Trollope and Mann posts ought to get the point across. Congratulations! I am honored to be in such great company! Congratulations, Tony. And say hi to your special friend for me. LOL. A big thanks to you all, and it's very nice to see a few fellow nominees here (as well as the usual suspects!). It will be interesting to see how it pans out, and I would love to know what criteria we're actually being judged on… and who the judges are (and whether they even like classic literature! ).